Dragon pictures have been drawn and painted for thousands of years. When we look at these ancient dragon pictures, we can see that dragons are obviously related to lizards -and the European species also has wings like a bat. Now, let’s draw our own dragon picture! 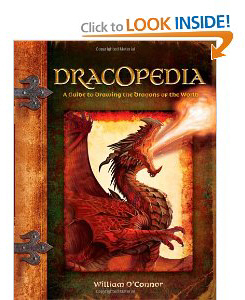 While doing the research for this page I learned that the original idea for dragons probably came from dinosaur bones. Dinosaurs were giant lizards, and the thought of living in a world that included them must have been a little scary. But that doesn’t explain the wings, does it? Maybe pterodactyl bones? Magical creatures often have parts or combinations of parts that never appear in the real world. 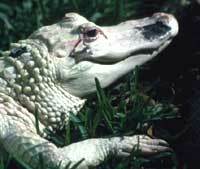 Sure, sometimes a creature, (or even a human), is born with a mix-up in the general plan. We then get an extra arm, or an extra head or two – or something gets left out. But it takes true magic, (or a good imagination), to create a creature with parts from two different, unrelated species. 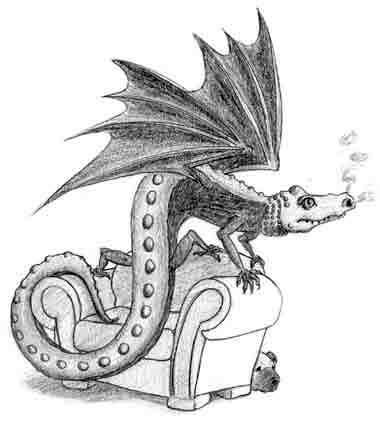 I love the idea of a dragon living in a house, like Hagar’s dragons do, so I’ve decided to draw our most recently famous dragon, Norbert, from Harry Potter and the Sorcerer’s Stone. If you’re a big fan of the book, you’ll see that my dragon doesn’t look anything like the dragon from the movie, and doesn’t have a ridge down his back, like J. K. Rowling described him. But he is in a house, which was the fun part for me. I’ve decided to use three different animals as models for my dragon drawing. The slinky thing up at the top of this page is actually a salamander, not a lizard, but I like the way he’s curled around. Once I’m done with him, he’ll be a lizard!. I’ll use an alligator head for the front end of the dragon, and the wings of the bat. So now we have all the pictures we need to make a slinky, wide-headed, bat-winged dragon. And I think it’s important to put in some furniture, because I really like the idea of a dragon in the house. 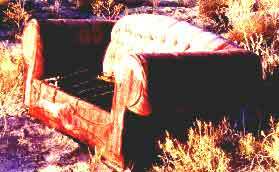 I found a picture of a very beat-up chair sitting out in the desert. It looks big enough for Hagar to sit in. I won’t include the weeds. Step two, make a rough sketch of the background. 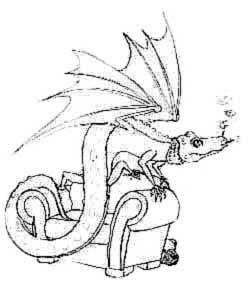 To make my rough drawing, I made a sketch of the chair, then put it behind a new piece of paper and drew The dragon on top of it, then traced the chair where it would show. That way I didn’t have to erase so much of the chair. (But then I had to do it all over, because I forgot to leave room for the wings).I put Fang behind the chair, trying to make himself scarce. Wouldn’t anybody? Step three, start drawing the dragon. Use all the photos you’ve collected, and try to connect all the different kinds of animals into a creature that seems plausible. I’m going to put in some of the bumps around the alligator’s neck, and concentrate on putting most of the fine detail on his head. 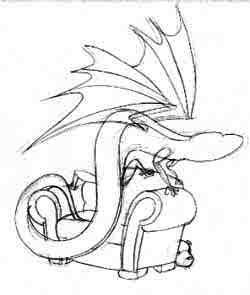 I’ll leave the chair fairly plain, so that it doesn’t take away our attention from the dragon. And I’ll play with making the dragon’s nostrils smoke. Did you know that the long bones in a bat’s wing are his fingers? Can you see where the elbow is on the photo of the flying bat? Since I’ve put in some of the bumps from the alligator, I thought it would look best if I gave the body some bumps, too. I’ve added them all down the center of his back. I think this makes him look great, but he’s now a different species from Norbert, who is a Norwegian Ridgeback dragon. Mine is a “bumpy-backed dragon.” But it’s my picture, and I can make it look anyway I want to. And so can you! I’ve also toned down the alligator’s “smile.” I didn’t want my dragon to look too friendly, after all. One thing we always need to be careful about is making our drawing seem too much like a cartoon. This would be easy to do, if we got too carried away with things like smoke or teeth. I lost a lot of detail when I scanned my drawing – I did these drawings a long time ago, before I really knew how to use the equipment. You’ll have to use your imagination, I’m afraid. Just keep working to make all the animals you’ve stuck together to make your dragon appear to belong on the same animal. You will have chosen different animals than I did – and you will probably want to change the shapes a bit, so you end up with a more mythical creature – but for a first try, this one isn’t too bad, is it? My dragon is all finished. If this is the chapter you started with, be sure and keep your drawing. Then come back and do this chapter again when you’ve finished the rest of the book. You can see Norbert in color at the top of all these pages.